The saints came matching in as well as over 2,000 participants, to the 2015 International Meeting for Simulation in Healthcare (IMSH) �Simulation Celebration� at the Ernest N. Morial Convention Center in New Orleans, Louisiana. IMSH is the premier educational and networking event for healthcare simulation from all disciplines. During this five day event (January 10-14), participants learned from subject matter experts on various topics including faculty development, creating a policy and procedures manual, the business aspects of simulation, overcoming challenges in assessment and leadership training. WISER leadership played a significant role in not only presenting these various topics but also in attending sessions that focused on improving patient safety and taking medical simulation to the next level. Also at the conference, Paul Phrampus, MD, was recognized for significant contributions advancing simulations globally through leadership and mentorship to advance the mission of SSH through his acceptance of a SSH Presidential Citation. After a ribbon cutting ceremony on Sunday, January 11th, the exhibit hall opened to conference participants. 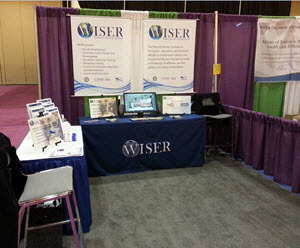 Among the vendors showcasing their latest technologies, the WISER booth displayed many courses ranging from the newest, Simulation Technician Training Program (Tech Sim) and Professional Development Program, to the well-established iSIM- Improving Simulation Instructional Methods. Overall, the WISER presence was positively felt at the 15th anniversary of IMSH. WISER hopes to see some familiar faces and have a strong impact next year when IMSH 2016 heads west to San Diego, California!